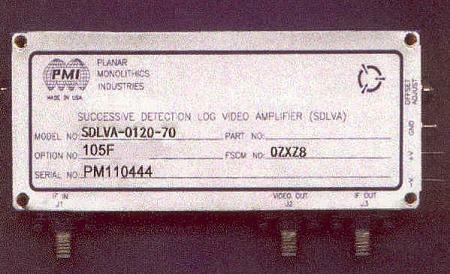 The Model SDLVA-0120-70 Option 105F Successive Detection Log Video Amplifier (SDLVA) Operates over the 1.4 to 1.6 GHz Range. 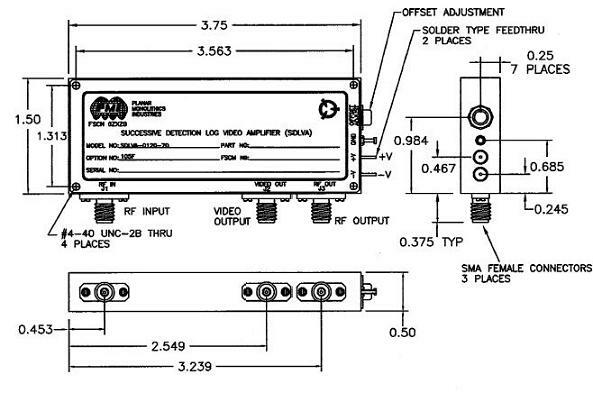 These units have a Dynamic Range of 65 to 70 dB, a TSS of -67 dBm, and a Nominal Video Bandwidth of 20 MHz. Furthermore, these units are designed using cutting edge GaAs technology which provides stunning performance and reliability in a compact package making it an optimum solution for high speed channelized receiver applications. These units offer typical fast Rise Time of ≤20 nS, Rapid Fall Time ≤25 nS, as well as superior Delay Time of 8 nS. The Log Slope is 25 mV/dB and the accuracy is less than ±1.0 dB over the -60 to 0 dBm power input range. Dynamic Range can be extended to -65/+5 with low error of ±1.5 dB. Options are available with adjustable logging slope and DC offsets. Guaranteed rise times are less than 25 nS and maximum recovery times are less than 30 nS. Recovery times at lower power are faster. The SDLVA-0120-70 SDLVA is commercially screened and characterized from -55ºC to +85ºC. Sizes available are 3.75" x 1.50" x 0.50" or to any other customized configuration desired.